Today I will be talking about confidence and how to gain it. What is confidence? Having confidence is when you feel sure of yourself and your abilities. This is a feeling that everyone needs to experience because it will help in reaching goals and making dreams come true. I am going to share examples of how I gained confidence in myself and some tips for building more confidence in others. I first started to gain self-confidence at an early age when I got involved with drama and music in elementary school. Then I got involved with Special Olympics sports which has different levels of competition so everyone has a chance to succeed. Special Olympics also helped me gain confidence in myself by giving me the chance to write speeches and speak in front of large groups. 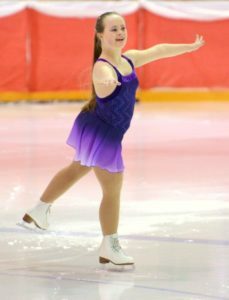 I found my voice when I joined VATTA and the Canadian Down Syndrome Society. 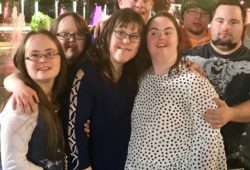 When I went to my first meeting in Toronto, I got to listen to others talk about the importance of people with Down Syndrome and their stories. 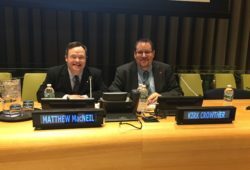 I even spoke to the board of the Canadian Down Syndrome Society. I continue to have my voice heard at meetings and conferences. At my first National conference I did a presentation titled “Being Your Best Self”. Today I want to share some tips and techniques on how to boost confidence in yourself. The first thing to remember is that children are not born with confidence. They have to work at it by trying new things and having success. Also, it’s up to others to build confidence in children as they grow up by using encouraging words like, “You can do it”, “Awesome job”, “You’re a super star” and “I believe in you”. Family and friends can also help build confidence by encouraging children to expand their social life. Also, facing your fears helps because you can go out in the world and try new things. Don’t fear failure, just try and do your best. The last tip is to step out of your comfort zone by trying new things one step at a time. This can be hard for some people, but if you don’t try, you can’t achieve your goals and dreams. Here is the quote that I follow in my life: “Turn your cant’s into cans and your dreams into plans.” Just remember that everyone needs help, not just kids, but parents too. So parents, go out and find support and information from others in your community like teachers, coaches, doctors and other specialists. Thank you for reading my blog on how to have confidence in yourself.